The Markandeya Purana is a famous one amongst the eighteen Mahapuranas. This Purana has a character different from that of all the others. It has nothing of a sectarial spirit, little of a religious tone; rarely inserting prayers and invocations to any deity; and such as are inserted are brief and moderate. It deals little in precepts, ceremonial or moral. 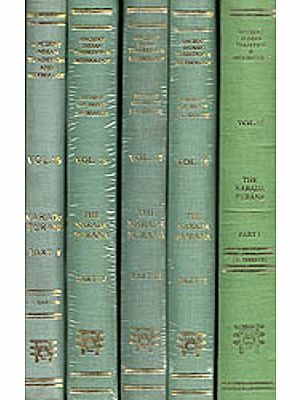 Its leading feature is narrative; and it presents an uninterrupted succession of legends, most of which when ancient are embellished with new circumstances, and when new partake so far of the spirit of the old, that they are disinterested creations of the imagination, having no particular motive, being designed to recommend no special doctrine or observance. 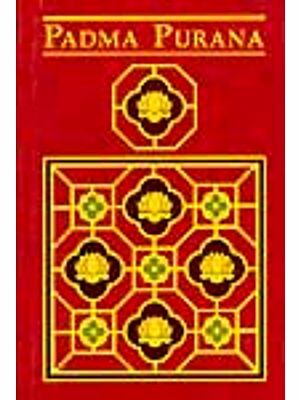 This translation of the Markandeya Purana being made for the Asiatic Society of Bengal naturally follows the edition of this work prepared by the Rev. Dr. K. M. Banerjee, and published in the Bibliotheca Indica in 1862; yet other editions and some MSS. have been consulted and are referred to. 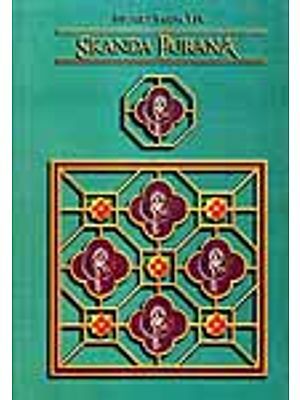 The translation has been kept as close to the original as possible, consistently with English sense and idiom; for a translation loses some of its interest and much of its trustworthiness, when the reader can never know whether it reproduces the original accurately or only the purport of the original. The time during which the work has been in hand has rendered it difficult to maintain one system of transliteration throughout; but, in order to place the whole in a consistent state, the system established by the Royal Asiatic Society and approved by the Asiatic Society of Bengal has been adopted in the Index and in this Introduction. The general character of this Purana has been well summed up by Prof. Wilson in his preface to his Translation of the Visnu Purana, except that his description hardly applies to the Devi-mahatmya. "This Purana has a character different from that of all the others. It has nothing of a sectarial spirit, little of a religious tone; rarely inserting prayers and invocations to any deity; and such as are inserted are brief and moderate. It deals little in precepts, ceremonial or moral. Its leading feature is narrative; and it presents an uninterrupted succession of legends, most of which when ancient are embellished with new circumstances, and when new partake so far of the spirit of the old, that they are disinterested creations of the imagination, having no particular motive, being designed to recommend no special doctrine or observance. Whether they are derived from any other source, or whether they are original inventions, it is not possible to ascertain. They are most probably, for the greater part at least, original; and the whole has been narrated in the compiler's own manner; a manner superior to that of the Puranas in general, with exception of the Bhagavata." 1. Chapter 1-9, in which Jaimini is referred by Markandeya to the wise Birds, and they directly explain to him the four questions that perplexed him and some connected matters. 2. 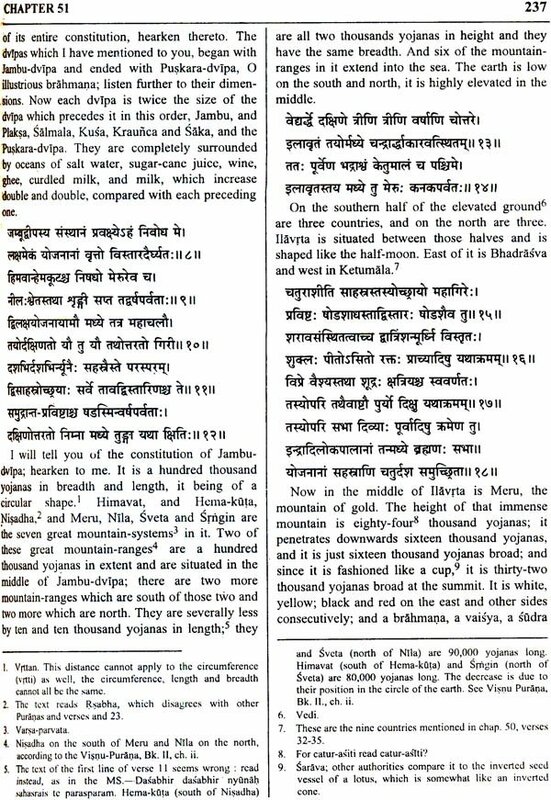 Chapter 10-41, where, though Jaimini propounds further questions to me Birds and they nominally expound them, yet the real speakers are Sumati, nicknamed Jada, and his father. 3. Chapter 42-79: here, though Jaimini and the Birds are the nominal speakers, yet the real speakers are Markandeya and his disciple Kraustuki. 4. 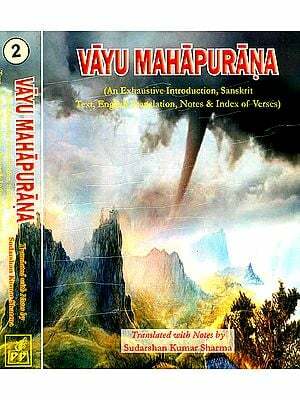 Chapter 80-89, the Devi-mahatmya, a pure interpolation, in which the real speaker is a rsi named Medhas, and which is only repeated by Markandeya. 5. Chapter 90-134, where Markandeya and Kraustuki carry on their discourse from chapter 78. The 134th chapter concludes the work; it is a necessary corollary to the first part. There can be no doubt that only the third and fifth of these parts constituted the Purana in its original shape as Markandeya's Purana. The name would imply that originally Markandeya was the chief figure, and it is only in the third part that he appears as the real teacher. There is, however, clearer evidence that the Purana began with the third part originally, for this is asserted almost positively in chapter 42, verses 16 to 25. There Markandeya, after declaring that this Purana, equally with the Vedas, issued from Brahma's mouth, says- "I will now tell it to you Hear all this from me as I formerly heard it when Daksa related it. "These words plainly mean that the true Purana began here; or, if the necessary words of introduction be prefixed, that it began at verse 16 or 17, which verses have been slightly modified since in order to dovetail them into the preceding portion. The first and second parts were composed afterwards and then prefixed to the Purana proper. That they were later compositions is implied by the fact that the Birds recite the Purana proper as an authority, and is indeed indicated by the origin attributed to them. While the original Purina was proclaimed to be a revelation from Brahma himself, no higher authority is claimed for the first and second parts than Markandeya and the unknown brahmana Sumati Jada. Further, mention is made in chapter 23, verse 33, of Puranas which narrate Visnu's manifestations. This expression is vague. If it means lengthy descriptions of some of the incarnations, such Puranas might be the Vis nu, Brahma-vaivarta, Brahma and Bhagavata; but the last two were pronounced by Prof. Wilson to be late compositions, and the reference here may be to the former two only, to which he assigned about an equal date with this Purana. There is nothing definite to show whether the first and second parts had been united before they were prefixed to the Purana proper, or whether the second part was inserted after the first had been prefixed; yet it would seem more probable that they had been united before they were prefixed. There is a marked similarity between them. The second part appears to have been amplified beyond its primary scope. It discourses about birth and death, about the helis, about sins and their punishments and about yoga or religious devotion. All these subjects are briefly dealt with, though the description of the different hells is ampler than in other Puranas, but the last subject leads to a discursive exposition. If dealt with like the other subjects, the exposition would pass from chapter 16, verse 12 immediately to chapter 34, where king Alarka is driven by adversity to seek Dattatreya's advice and that rsi expounds the doctrines of yoga to him in chapters 35 to 40, and the story naturally closes with chapter 41. But the reference to that king and that rsi was considered to require some elucidation at. chapter 16, verse 13, hence the story of Dattatreya and the story of Alarka's parents Rtadhvaja and Madalasa are made the introduction to the direct exposition of yoga, with the result that the digression is so long that, when the subject of yoga is reached, its connection with Jaimini's questions has been lost to sight; and even the passage from the story of Dattatreya to that of Alarka at the end of chapter 16 is inapt and abrupt. Both these stories moreover appear in their turn to have been expanded beyond their natural course. The story of the Brahmana and his devoted wife in chapter 16, which furnishes an unnecessary explanation of the birth of Dattatreya, is a story of common town life, an absurd anachronism compared with what it explains; and it seems with its reference to a temple dedicated to Anasuya during her life-time to be an interpolation intended for her glorification. The story of Rtadhvaja and Madalasa is a charming one of simple marvel and runs its natural course in chapters 17 to 24 as far as Madalasa's instruction of her son Alarka in kingly duties; but the following chapters 25 to 32, in which she expounds the laws regarding brahmanas, sraddhas, custom, etc., hardly accord with the story or with her position and knowledge, and seem to be an interpolation. Some teaching on such matters being deemed desirable, here was the only place where the addition was possible. Chapters 1-9, in which Jaimini is referred by Markandeya to the wise Birds, and they directly explain to him the four questions that perplexed him and some connected matters. Chapters 10-41, where, though Jaimini propounds further questions to the Birds and they nominally expound them, yet the real speakers are Sumati, nicknamed Jada, and his father. Chapters 42-78: here, though Jaimini and the Birds are the nominal speakers, yet the real speakers are Markandeya and his disciple Kraustuki. Chapters 79-90, the Devi-mahatmya, (popularly known as Durgasaptasati) a pure interpolation, in which the real speaker is a rsi named Medhas, and which is only repeated by Markandeya. Chapters 91-134, Markandeya and Kraustuki carry on their discourse. In the end, the Birds close here the long discourse delivered by Markandeya, and Jaimini thanks them and departs. 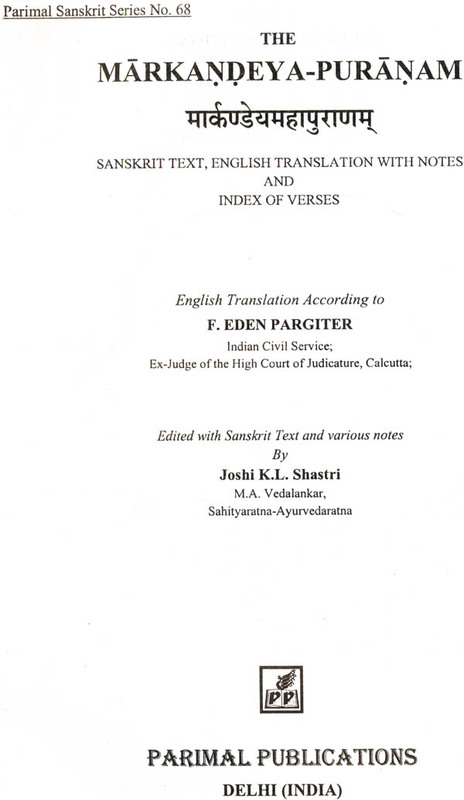 The present edition is a newly composed and revised with currently available Sanskrit text and Pargiter's translation. Also, the editor has rendered his own translation at appropriate places and ignored the translation of flowless verses that are found in the available text of Bombay edition and other available editions. Jaimini applied to Markandeya for instruction on four questions. Markandeya referred him to four learned Birds, sons of Drona and the Apsaras Vapu who was cursed by the rsi Durvasas to be a bird; and narrated the story of their birth, and of their education by Samika; and explained that they were four brahmanas, who were so born, because cursed by their father Sukrsa for not offering their bodies as food to a famished bird. Jaimini visited the Birds at the Vindhya Mts. and they answered his four questions thus:- Visnu assumed bodily forms in order to accomplish good; Draupadi became the joint wife of the five Pandavas because they were all emanations of Indra; Baladeva committed brahmanicide during intoxication and expiated it by pilgrimage; and five Visva Devas, who, on seeing Visvamitra's brutality to king Hariscandra, censured Visvamitra, incurred his curse thereby and were born as the five sons of Draupadi to die young and unmarried. This story led the Birds at Jaimini's request to narrate the whole story of king Hariscandra's sufferings and ultimate beatitude; and the terrible fight which resulted therefrom between Vasistha and Visvamitra as gigantic birds. Jaimini propounded further questions regarding conception, foetal life, birth, growth, death and the consequences of action; and the Birds answered them by reproducing the instruction that a Brahman, Sumati, nick-named Jada, once gave to his father (chapters 10-30). Thus, the Birds gave in Jada's words a description of death, after-existence's and certain hells; of human conception and birth, and the evils of all existence; of certain other hells and the various terrible torments inflicted there; and they narrated the story of king Vipascit's descent into hell, with a discourse regarding actions and the specific punishments for a long list of various sins, and of his deliverance from hell together with other persons confined there. The Birds, continuing Jada's discourse, broached the subject of yoga or religious devotion, but prefaced it with a long narrative (chapters 16 to 39). A brahman Mandavya was saved from a curse by his devoted wife, who stopped the rising of the sun and gained a boon from Atri's wife Anasuya; the gods in consequence blessed Anasuya, and Brahma, Visnu and Siva were born as her three sons Soma, Dattatreya and Durvasas; Dattatreya indulged in sensual pleasures; Arjuna Kartavirya, however, being advised by his minister Garga to propitiate Dattatreya, because Dattatreya (being an incarnation of Visnu) had once 'saved the gods from the demons, did so and by Dattatreya's blessing reigned gloriously. 106 This led on to the story of Alarka, which is used to convey political, religious and social instruction (chapters 17-41). King Satrujit's son Rtadhvaja lived in intimate friendship with two Naga princes; they told their father Asvatara - how Rtadhvaja had succoured the Brahman Galava with the help of a wondrous horse named Kuvalaya, and descending to Patala, had killed the demon Patala-ketu there, and had rescued and married the Gandharva princess Madalasa, and was famed as Kuvalayasva; and also how a demon had caused Madalasa to die on a false report of Kuvalayasva's death. King Asvatara, by propitiating Sarasvati then, gained perfect skill in poetry and music (which are described), and by propitiating Siva received Madalasa restored to life; he invited Kuvalayasva to Patala and gave Madalasa back to him. Kuvalayasva had a son by her, and she prattled to the infant; they had three other sons and she named the youngest Alarka. Then followed an exposition of political, religious and social doctrine in the guise of instruction given by Madalasa to Alarka. She instructed him in the duties and conduct of a king; in the duties of the four castes and of a brahmana's life; in the general duties of a grhastha and various religious matters; in the duties of a grhastha in detail; in the sraddha ceremonies; in the performance of the Parvana Sraddha and the persons to be excluded; in the Voluntary sraddhas and their benefits and proper occasions; in the rules of Virtuous Custom, generally and with much detail; about diet, purification, conduct, holy days and various religious ceremonies. Rtadhvaja then resigned his kingdom to Alarka and departed to the forest. Alarka lived in pleasure, but, being reduced to great straits by his brother and the king of Kasi, sought relief from Dattatreya. Dattatreya spoke about the soul and, on Alarka's asking about religious devotion (yoga), expounded the method, conditions and signs of its proper performance; the attendant ailments and the stages which lead to final emancipation from existence; the way in which a yogi should live, beg, eat and reach his end; the composition, meaning and efficacy of the word "Om"; ill omens and their signification; and the seasons for, and the importance of, yoga. Alarka then relinquished the kingdom, but his brother, glad at 'Alarka's conversion, declined it and departed. Alarka gave it to his son and departed to the forest. This ends Jada's exposition. Jaimini put further questions, and the Birds answered them by repeating what Markandeya had taught Kraustuki. This discourse runs on to the end of the Purana. Markandeya, after extolling this Purana, described the course of creation from Brahma through Pradhana, and the mundane egg; he discoursed about Brahma, and explained divine and human time and the four ages. He described the creation of the earth and all it contains; the gods, demons, pitrs, manking, and the positions assigned them; the origin of the primeval human race and its social and moral evolution; the birth of the nine Sages, Rudra, Manu Svayambhuva and his descendants, Daksa and his offspring; A-dharma and his progeny, especially the goblin Duhsaha and his powers, whose brood of goblins and hags are named with their particular functions; the creation of the Kudras; and the wives and offspring of the rsis and pitrs. Markandeya next discoursed of the Manus and manvantaras. He told of the first Manu, Svayambhuva, and his descendants who peopled the seven Continents. Jambudvipa was occupied by Agnidhra, and his descendant Bharata gave his name to India. This introduced the subject of geography. 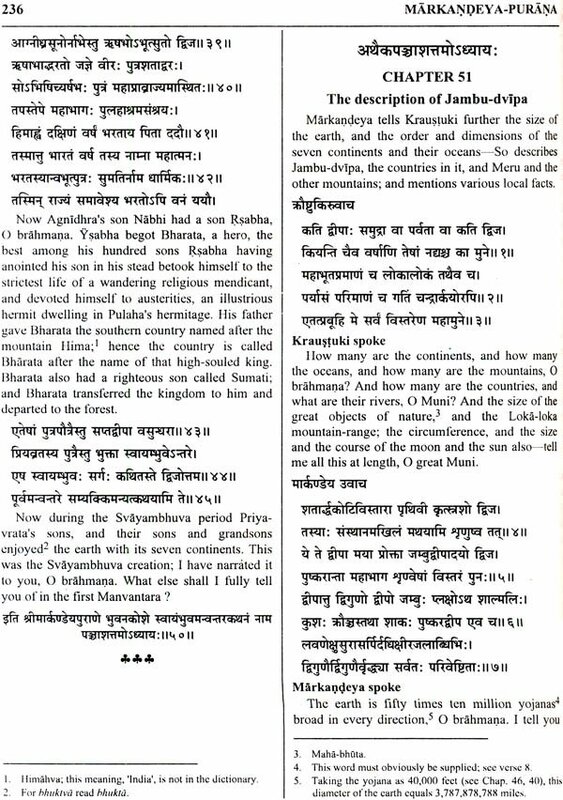 Markandeya described the earth and its continents, especially Jambu-dvipa; and also Mount Meru, first briefly, and then with full mention of neighboring forests, lakes and mountains; and the course of the Ganges in the sky and on the earth. He mentioned the nine divisions of Bharata, and then dealt with India in detail; naming its seven mountain ranges and its scattered hills; and its rivers, distinguishing them according to their sources, in the Himalaya, the Paripatra, the Vindhya, the Rksa, the Sahya, the Malaya, the Mahendra and the Suktimat ranges. He named the various peoples inhabiting India and its confines, according as they dwelt in the Middle Land (Madhya-desa), in the north-west, outside northwards, in the north, in the east, in the south, in the west, around the Vindhya mountains and beneath the Himalayas. Next representing India as resting upon Visnu in the form of a tortoise, Markandeya named the various peoples (with the corresponding lunar constellations) as they were distributed over the middle of the tortoise's body, over its face, its right fore-foot, its right flank, its right hind-food, its tail, its left hind-foot, its left flank and its left fore-foot; and he added some astrological, religious and political comments. He then described the countries Bhadrasva, Ketumala, the Northern Kurus, Kimpurusa, Hari-varsa, Ilavrta, Ramyaka, and Hiranmaya. Markandeya related the birth of the second Manu. A Brahman visited Himavat and met an Apsaras Varuthini; a Gandharva Kali by personating him gained her affection and she bore a son Svarocis. Svarocis delivered a maiden Manorama from a curse and married her, and also rescued her two girl-companions and married them; after living long in heedless pleasure with them, he had three sons whom he established in separate kingdoms by the knowledge called Padmini; and he had by a forest goddess another son Dyutimat who became the second Manu, Svarocisa; and his period is noticed. The allusion to the knowledge Padmini introduced a discourse on its supporters, the Nidhis. Continuing, Markandeya related how king Uttama banished his queen for bad temper, and helped a Brahman to find his ill-tempered wife who had been carried off; he was rebuked by a rsi for his own conduct; he recovered the brahman's wife, whose bad hidden; the Brahman changed her nature and the Raksasa restored her to king Uttama; she bore a son, who became the third Manu, Auttama, and his period is noticed. Markandeya related how king Svarastra when driven from his kingdom, met his deceased queen, and had a son who became the fourth Manu, Tamasa; his period is noticed. The rsi Rtavac made the constellation Revati fall; a maiden was born therefrom; she married king Durgama and bore a son, who became the fifth Manu, Raivata; his period is noticed. Caksusa, being changed when an infant by a hag, became kingVikranta's son, but turned an ascetic and became the sixth Manu, Caksusa; his period is noticed. Continuing the manvantaras, Markandeya said the Sun married Tvastr's daughter Sanjna and had two sons Vaivasvata and Yama; Sanjna quitted him, leaving her Shadow behind, because his splendour was excessive; Tvastr pared his splendour down while the eighth Manu, Savarni. Vaivasvatais the seventh and present Manu; his period is noticed. The future period of Sevarni with its rsis, gods, etc., is prophesied. The mention of Savarni introduced the Devi-mahatmya. Markandeya related that king Suratha, being ousted from his kingdom, met a Vaisya driven from his family, and both consulted a rsi about their longings for home; the rsi ascribed their feelings to the goddess Maha-maya (Great Illusion), and related how, when she was lauded by Brahma, Visnu slew the demons Madhu and Kaitabha. The rsi then recited her exploits. Here begins the Devi-mahatmya properly. The demons under Mahisa vanquished the gods, and the goddess was formed as Candika, (Ambika) out of their special energies combined; she began a great battle and destroyed the demons, all the demon chiefs and finally Mahisa himself. The gods praised her in a hymn, and she promised to befriend them always. Again the gods were vanquished by the demons Sumbha and Nisumbha, and invoked her; she appeared, and Sumbha wanted to marry her but she declined; he sent an army and she destroyed it; he sent another with Canda and Munda; the goddess Kali destroyed them and Candika gave her the combined name Camunda; Sumbha sent all his armies; Candika killed the chief Raktavija, then Nisumbha in spite of Sumbha's aid, and many demons, and finally Sumbha himself; whereat the universe was filled with joy. The gods praised her in a hymn and she promised to deliver them always. She descanted on the merits of this poem. The gods regained their supremacy; and she is extolled. Here ends the Devi-mahatmya properly. After hearing this poem King Suratha worshipped Candika, and she promised he should be the eighth Manu, Savarni. Markandeya, continuing, mentioned the other future Manus, the ninth, tenth, eleventh and twelfth named Savarna, and the thirteenth named Raucya, and their periods. H. narrated the story of Raucya. A Prajapati Ruci was urged by the Pitrs to marry; he propitiated Brahma and pleased the Pitrs in a hymn; they appeared and promised him a wife and extolled his hymn; he married an Apsaras and had a son who will be the thirteenth Manu Raucya. Santi, the disciple of art irascible rsi Bhuti, finding the sacred fire extinguished, offered a hymn to Agni. Agni restored the fire and promised to Bhiiti a son who should he the fourteenth Manu, Bhautya. Bhautya's period is noticed. This account of the manvantaras is extolled. At Kraustuki's request Markandeya began the genealogies. Brahma creates Daksa, from whom came Martanda, the Sun. Then mentioning that Brahma was born from the mundane egg, and produced the lokas (worlds), and next the four Vedas with their merits - Markandeya diverged into a laudation of the Sun. The gods and the Vedas are declared to be manifestations of the Sun. The sun's glory was at first too great, and Brahma with a hymn induced him to contract it and then finished the creation. Marici's son Kasyapa begot the gods, demons, mankind, etc. The demons overcame the gods and Aditi sought help of the Sun in a hymn. He became her son as Martnda and destroyed the demons. The story of the Sun and his wife Sanjna (as told in chapters 74 and 75) is re-told here with more detail regarding the Shadow-Sanjna, the curse on Yama, the paring down of the Sun's splendour, the hymns offered to the Sun, and the Sun's offspring and the stations allotted them. Further Markandeya related that king Rajya-vardhana when old resolved to resign the kingdom, but his people in grief propitiated the Sun, and the Sun granted him great length of life; the king similarly obtained the same boon for them. This story is extolled. Markandeya mentioned Manu Vaivasvata's seven sons and Ila-Sudyumna, Pururavas, etc. Manu's son Pusadhra killed a brahman's cow and being cursed became a sudra. Karusa's descendants were mentioned. Dista's son Nabhaga married a vaisya maiden willfully and became a vaisya; their son Bhanandana conquered the earth, but Nabhaga declined to reign. Then Nabhaga's wife explained that she was not really a promise of recovery, and that she was a princess and had become a vaisya under Agastya's curse. Bhanandana became king. His son Vatsapri rescued a princess Sunanda from Patala after killing a demon king who had a magic club and married her. His son was Pramsu and Pransu's son Prajati. Prajati's son Khanitra was beneficent; his brother's ministers practiced magic to dethrone him but destroyed themselves; Khanitra resigned the kingdom in grief and went to the forest. His son Ksupa performed sacrifices for the harvests. His son was Vira and grandsom Yivimsa. Vivimsa's son Khaninetra while hunting met two deer eager to be sacrificed and by Indra's favour obtained a son Balasva. Balasva was called Karandhama because of a fanciful victory. His son Aviksit married man princesses and carried off princess Vaisaini at her svayamvara; the suitor kings conquered and captured him, but she refused them all; Karandhama rescued Aviksit, but Aviksit refused to marry the princess after his discomfiture; she turned to austerities and obtained an assurance from the gods: Aviksit's mother by a ruse obtained a promise from him to beget a son: while hunting he rescued the princess from a demon and pleased the gods: she proved to be a Gandharvamaiden and Aviksit married her in the Gandharva world; She bore a son Marutta there Aviksit returned but refused the kingdom because of his discomfiture. Marutta became king, and was 653 a universal monarch, a great sacrificer, and liberal benefactor to brahmans. The Nagas gave great trouble, and he attacked them, but Aviksit interposed in favour of the Nagas; a battle was averted by the rsis, and the Nagas made reparation. Marutta's wives are named. His son Narisyanta enriched the brahmans permanently at a great sacrifice. His son Dama was chosen by the Dasarna princess, and defeated the suitor kings, who, in violation of marriage laws, opposed him. Dama became king. Narisyanta was murdered in the forest by Vapusmat one of those kings. Dama bewailed, and vowed vengeance against the murderer; he slew Vapusmat and celebrated his father's obsequies with Vapusmat's flesh and blood. The Birds closed their long repetition of Markandeya's instruction to Kraustuki, with an encomium on the Puranas and this Purana in particular. Jaimini thanked them.